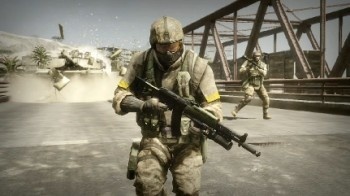 Market analyst Mike Hickey believes that the Bad Company series could steal the first person shooter crown from Modern Warfare 2. Mike Hickey, an analyst for Janco Partners, believes that EA's Battlefield: Bad Company series has the potential to be a "Modern Warfare killer," and that EA is currently sitting on a number of very large franchises. "We're encouraged by the strong sales performance from emerging mega franchises like Mass Effect, Dragon Age and Battlefield, which we see as a potential Modern Warfare killer," he said. "EA has been plagued over the last several years by franchise fatigue and new IP market fragility ... [which] we believe they have stabilized and/or eliminated from their forward game slate." "We remain optimistic for potential upside from games like Medal of Honor (a prior power franchise), Bulletstorm (cover of May Game Informer magazine), Dead Space 2 and the unannounced new IP (potential fiscal 2012 release) from the newly formed Respawn Entertainment studio through EA Partners."